When we created Elephant Branded we wanted to be part of the solution to the global problem of poverty. You don’t need us to tell you that there is a lot of work going on to fight poverty in Africa. We just want to do our bit as well and we wanted to work with an organisation that shared our values. When we saw Education Africa’s motto then we knew they were the organisation for us! Education Africa is a non-profit organisation with a proud track record of successful delivery on its thriving projects. Under the motto “making real change happen; poverty alleviation through education” Education Africa does a huge amount of work in Africa with an educational focus. With this in mind, to date we have donated over 1000 stationery kits via Education Africa. All of them are sourced locally to avoid having to ship them half way across the world. This means that both the local economy and the atmosphere benefits! The children also now have some of the tools they need to make the most of school. We think that is pretty cool. We wanted to help out where Elephant Branded was born. Without Cambodia, Elephant Branded wouldn’t exist and so we want to do our bit by giving back to the communities that have helped us provide you with some amazing, ethically sourced products. To do this, we wanted to work with an incredible organisation that we trusted. We wanted to work with people that shared our values and wanted to help the children that are destined to become the next generation of leaders in Cambodia. Luckily for us, we found CCF, a charity lead by an inspirational man who is ensuring that thousands of children get the chance that they deserve. Founded in 2004, Cambodian Children’s Fund provides life-changing education, nourishment and healing to vulnerable children from some of Cambodia’s most destitute communities. In the beginning, their world revolved around the health and well-being of 87 youngsters. Today they care for more than 2,000 children and extend their services to provide for their families and communities in crisis. CCF was founded by former film executive Scott Neeson, who traveled to Cambodia on holiday in early 2003 and found his life changed by the desperate circumstances and unlikely courage of Phnom Penh’s most impoverished children. Today, he serves as CCF’s Executive Director, performing daily fieldwork and overseeing the operations of CCF’s various facilities. Accepting responsibility for a child’s comprehensive care might appear to be a single mission, but it isn’t. They offer education, health care, nutrition and safe shelter. These elements stand as four interdependent walls, joined together with dedication and compassion to provide a full house. In order to develop and heal, the connection with family and community is essential. Allowing the parents the opportunity to lift themselves from poverty — while ensuring that the child’s siblings have access to education and helping rebuild a sense of community — not only provides for the greater good but also alleviates the adult-like burdens of the child. The majority of children in our care were former garbage pickers and primary caretakers of their siblings, living and working on Phnom Penh’s former municipal garbage dump. In addition to the top-quality programs that form the backbone of CCF’s education centers, they run a broad spectrum of fully integrated community services that collectively offer the strongest possible safety net for families in crisis. Every outreach project we develop flows from the realization and acceptance that CCF’s children have links and roots that need nurturing if they themselves are to fully prosper and grow. CCF is dedicated to giving its students the chance to discover their individual voices. They are proud to see their students demonstrate intolerance for injustice, a strong sense of self-worth and a deep sense of compassion and respect for their communities and country — ultimately honing their potential to emerge as leaders and progressive spokespeople enacting positive social change. As you can see, CCF does some incredible work and we are now helping them; it is something that we are very proud of. This September, the first shipment of 500 bags are arriving with CCF. 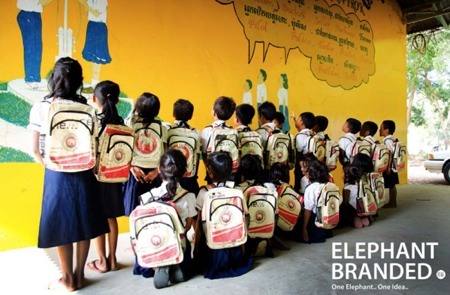 Each bag has been handmade by our friends in Cambodia out of the same strong materials that makes the Elephant Branded products we sell to people like you. This means that the maximum benefits remain in Cambodia. Through working with CCF, we are ensuring that the children they support have some of the school equipment that they need to make sure they make the most of their time at school. We are also creating more business for our friends in Cambodia which means their communities can prosper in a sustainable and robust way. Without your help, none of this would happen so thank you! Visit their website if you want to find out more. This company is amazing and has a similar mindset to us. They do amazing holidays and travel experiences but also do a lot of work to help to support the communities in which they operate. They prove that business can do good and we love that. If you want to find out more then please go on their website. With a massive amount of support from the RSC, 500 children are getting school bags when they start school this September. This means that they can carry their school kit during their long walks to school and, more importantly, means they’ve got everything they need to work when they get there. The bags have travelled all the way from France to Malawi to reach them and so we wanted to do something to offset the carbon emissions that this huge journey created. Working closely with the local community and RSC, each of the children have planted a tree in the village that the bags are going to. Not only will these trees offset the emissions but they will also provide a valuable resource for a village that is determined to escape poverty. Watch this space for pictures and thank you for all your letters and films! Lots of people ask why our donations are such an important part of what we do. They say that it makes life more complicated and that we don't need to. They are right. It does make things more complex at times and there is certainly nobody making us donate. The fact is that we wouldn't be Elephant Branded if we didn't donate. We would be like everybody else (well nearly everybody else) and we want to do things differently. We want to give people like you a choice and we want to give a hand to people that need one. By doing what we do, we want to give you the option of being different in an ethical, stylish and sustainable way. Our products speak for themselves but what makes each product better than so many others is what they encourage and enable. When you buy an Elephant Branded bag you get an Elephant Branded bag. When you buy an Elephant Branded purse you get an Elephant Branded purse and so on. In that way, there isn't anything that different but, and this is where we think it all gets really special, you also buy an idea; An idea that our donation equipment brings to life. In fact, without it, this idea wouldn't work, wouldn't exist and wouldn't allow thousands of children to turn our idea into their reality. Without the tools you help to provide, our idea wouldn't exist and that would be a shame. We know that we aren't going to change the world over night; we'd be mad if we did. However, with your help and the hard work of our amazing donating partners we believe that we can change lots of these children's individual worlds and that is good enough for us. Who knows, it might also encourage other organisations to help out too. Our donation partners are fantastic and without them, we couldn't ensure that the school bags and stationery supplies get to the children that need them. They're the unsung heroes of what Elephant Branded represents so we've decided to tell you a little more about them below. We hope you like them as much as we do. We work with some amazing organisations to ensure that each and every donation product is delivered to the child that needs it. 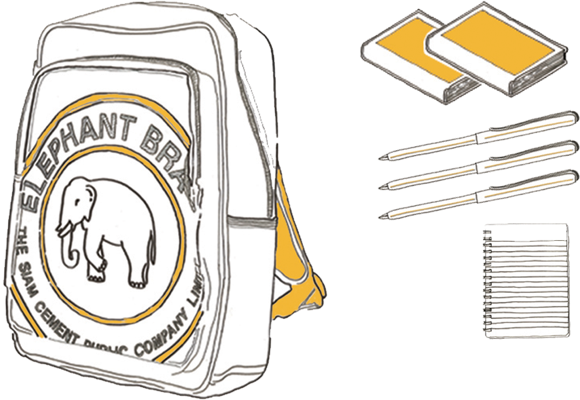 We guarantee that for each product sold, we will donate school equipment to a child that needs it. One Elephant...One Idea..
Each partner organisation is checked before working with them. Please find more information on their websites. Where possible, donation equipment is sourced in country to develop local economies and avoid transportation emissions. Elephant Branded absorbs the cost of all donation equipment through each product we sell.